ACTAtek and Thinking Software (www.thinking-software.com) have collaborated to provide businesses a complete HR solution that caters for all workforce management, payroll and security needs. Using the ACTAtek SOAP API SDK, Thinking Software integrated their ROTA HORIZON application with the ACTAtek ID Management Platform. Rota Horizon is an enterprise orientated human resource solution with the aim of lowering payroll costs and better staff efficiency. Assign employees with unique multiple pay rates, contract rules, holidays plans and many more. Built in "Employee Year View" provides a overall summary of working time and absence history. Plan in advance of budget costs and department rota, know who's have planned absences ahead of time to adapt situations quickly. Rota Horizon's Demand-Scheduling Module allows on demand scheduling allows you to plan your resources efficiently by allocating employees to areas that needs attention most. The Rota Horizon solution can integrate with ACTAtek Access Control solutions to consolidate time and costs to create the complete HR solution for your business. Time & Attendance Reports - Rota Horizon can quickly automate calculations on employees to ensure they're working within their contracted hours. Accurate Payroll Cost Forecasts - Real-time link to ACTAtek's Access Control systems allows you to create payroll forecasts in seconds. 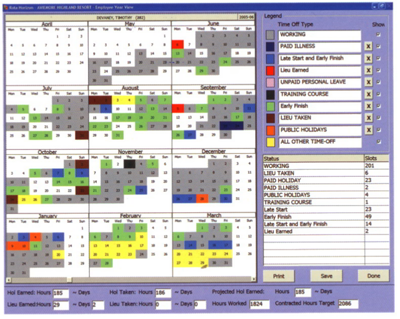 Holiday Planning & Absence Control - Rota Horizon provides a range of tools to efficiently manage holidays and control of absenteeism. ACTAtek SOAP API technology - Allows seamless compatibility to exchange and transact data from the terminals to Rota Horizon. Thinking Software's Pay-Link module allows transfer of Time Attendance and HR data into Payroll programmes allowing administrators to save time and increased accuracy. Rota Horizon's Pay-Link module allows easy integration with many popular payroll products on the market today. Thinking Software's MAKE-MY-PAY technology allows up to the minute automatic transfers of payroll and HR data to wherever it needs to go. Pay-Link can easily import and export employee details to gather all hours worked and current pay rates, saving admin time and increased data accuracy. Rota Horizon can produce a huge range of clear, concise reports that analyses vital information about your business and the people that work in it. Rota Horizon's Report Scheduler can be configured to automatically deliver selected reports by email to a list of authorised users. Range of reports with clear and concise analytical details of business and employee performance.